Whereas security of power supply was a key concern for Eskom two years ago, the focus has now shifted to managing surplus capacity and aggressively increasing electricity sales volumes, both within South Africa and to neighbouring countries. Among the contributors to Eskom’s new found excess of capacity is unit 1 of the 6 x 800 MWe Kusile supercritical coal fired plant. This went into full commercial operation on 30 August, 11 months ahead of a previously announced target commercial operation date, July 2018. 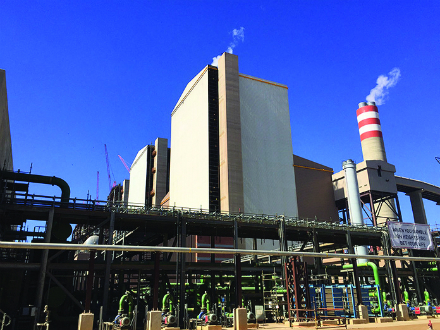 The Kusile power station, the first power plant in Africa to be equipped with flue gas desulphurisation, is located close to the existing Kendal plant, near eMalahleni in the Nkangala District, Mpumalanga. Completion of all six units is expected in 2022. The six boilers for Kusile are being supplied by MHPS, which is also supplying the supercritical boilers for Eskom’s 6 x 800 Medupi new build project, where two of the six units are in operation.